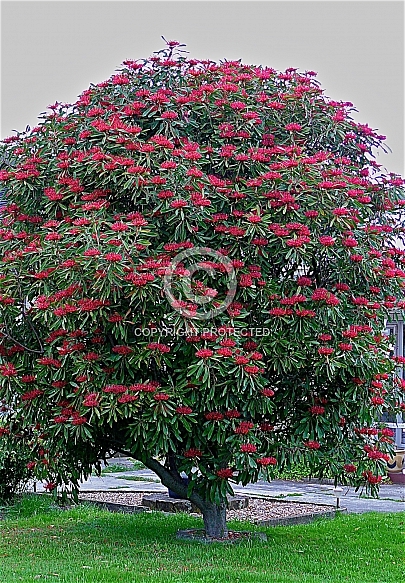 Description: Telopea oreades, the Victorian waratah, is notable for being one of the hardiest species and particularly long lived. It is sometimes used in hybridising and also as a rootstock for grafting selections of T. speciosissima that have proved difficult to strike from cuttings, although tissue culture is now bypassing this technique. While it is not often used as a garden plant today, with the abundance of spectacular hybrids on offer, T. oreades does still have a place in gardens prone to very hard frosts, and it will also make an ornamental background plant when left to assume its natural habit as a 12 m high, broadly branched tree - see illustration. Kept pruned and shaped it will form a larger and spectacular specimen shrub. The flower heads of deep crimson colouring are distinguished from the better-known T. speciosissima by their flat-topped, open shape. They are produced during spring, and in higher altitudes or colder districts may appear up to a month later than in warmer climates. Leaf margins are smooth, lacking the teeth or serrations of T. speciosissima. This species has been recorded as surviving in gardens subject to frosts of -15 ºC It prefers reasonably fertile, well-drained soils that have some organic content and retain moisture over summer.